Epo moto jangrofa, Epo moto jangrofa, that was a song on the lips of kids when we were growing up in present Ondo, Ekiti and Osun states. We chanted this with our innocent minds not knowing we were singing money, we were singing wealth, we were singing Jatropha, the magic plant, a veritable source of money and Nigeria’s untapped Goldmine. Each day, I get more convinced that a covenant with the soil is a covenant with wealth. No wonder, every and all things, man has converted to money is buried in the womb of the soil and the seas. Jatropha, Jatropha curcas (dodoromi, lapalapa, Olobotuje,) grows freely in the south of Nigeria, you didn’t have to plant it, it had planted itself—those days I mean. I now remember how my grandmother used the leaves for local bartique, how we used the branches as chewing stick and how we used the leaves to clean our anuses when we went to the backyard to poo, because the leaves were so near the ground, you could squat and still pluck the leaves as small as we were. Older people were using the plant as fence and when closely knitted together, they were used as bathrooms. The plant was everywhere then but if you were to plant Jatropha today, you probably have to buy or import the seeds. What a people, what a country. Malaysia came here to borrow or buy palm seeds, now they are world number one palm oil producer while we are nowhere near the top. If Jatropha was a source of biodieselfuel, known to even toddlers, more than 60 years ago, what has Nigeria done with it? While other countries have gone far ahead in making money from this plant, we have forgotten it. In any case it’s not the only source of money we do not care about. Gold in Ilesha, Tin in Jos, Stock fish in Igbokoda, Ondo state, bauxite etc, are all lying fallow in the ground untapped. As we write this, countries like Philippines, Brazil and Pakistan use biodiesel fuel produced from jatropha seed. Airlines such as Air China and Air New Zealand have successfully carried out flights with Oil from Jatropha. Jatrotha is not used only as a source of biofuel. This plant is like the palm tree, no part of it is useless. From the leaves, to the branches, to the steam and the roots not to talk about the seeds, Jatropha is indeed a magic plant. The latex contains, wax, resin, and tannin, which are useful in treating gum bleeding. It also heals wounds, toothache and also acts as antibacterial. The stem, the bark, and branches contains secondary metabolites such as steroids, tannins which are said to be biologically active and effective in aiding antimicrobial activities. It is also a strong antimicrobial agent. The fruit/seed heals burn, fights fever and convulsions, skin diseases and rheumatism..
Leaves can heal wounds, virginal bleeding, leukemia, malaria and mouth infections. 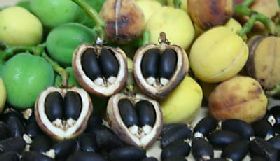 The seed of Jatropha early produces biodiesel that can be used as alternative diesel for cars, jets etc. This is probably the biggest commercial use of this plant. The bark of Jatropha plant and the leaves produce a dark blue dye which is used for colouring cloths, fishing nets and lines. The die dries fast and it lasts. I should know this because my grandma used it in her local bartique. Could be used as a source of manure. Jatropha also serves as animal feed. The oil can also be used to make soap, candles and cosmetics. It is also used to soften leather. The biggest advantage of Jatropha to me is the ease of entrance into the farming business. The cultivation is not complicated. Dead easy. No fear of rodents and other animals in the farm as you have with many crops. When they grow up, their canopy covers their beneath which frees you of weeding. Market. There is international market for Jatropha and there are exporters in Nigeria whom you can sell to. As we are writing this, I think it is more than N800/kg for the seeds. Before you go into it, please do due diligence and research and ensure the buyer is there. If you are a big farmer you can export directly as internet has made things much easier. The world now is indeed a village. Conclusion. This business ides is lucrative.